Sports-Fitness-Solutions Newsletter, Issue #033--DO YOU EAT TOO MUCH? Do you eat too much at each meal. According PH.D. Brian Wansink in his book "Mindless Eating," we make over 200 food decisions each day; whether we realize it or not. He concludes that your weight it the sum total of your past food decisions; and I'd have to agree with this conclusion. According to Brian, overeating can be greatly reduced simply by removing the cues in your environment that cause you to overeat. He lists 5 danger zones to over eating and weight gain, and I think it's worth a moment to take a look each one. Does this sound like you? At mealtime you really stuff yourself. You clean everything off your plate, eat quickly and often go back for seconds. You consider yourself to have a “healthy appetite” and often feel uncomfortably full after eating. Is this you? If it is, how do you stop this cycle of over eating? One way is to use the Half-Plate Rule: fill half of your plate with vegetables and the other half with protein and starch. Other ways are to:use smaller plates and wait 20 minutes before deciding if you want seconds. Eat slower so your appetite can catch up with what you've already eaten. Don't place serving dishes on the table. Pre-plate your food and then put the rest out of reach. Is this you? You eat whatever food is within reach, and snack at least three times throughout the day. You can't walk past a candy dish without dipping in. Your snacking is rarely done out of hunger it's done out of habit. So what do you do? Try these ideas: Chew gum throughout your day to avoid mindless munching. Keep tempting snack foods out of sight and out of mind. Never eat directly from a package. Portion out your snack into a dish. Don't purchase tempting snack foods for future snacking. Keep a wide variety of fruits and vegetables on hand instead. When attend a party or get together, does this sound like you? Whenever you attend a social event where the main attraction is food, you eat without stopping. With all the socializing you quickly lose track of how much you've consumed and often stop eating only when it's time to leave. Here are some ideas that may help. Stay more than an arm's length away from the buffet or snack bowls. Put only two food items on your plate during each trip to the table. Make yourself feel full by eating the big healthy stuff first, like broccoli and carrots. Finally remind yourself why you are at the party: first to socialize and secondarily to eat. Do you enjoy eating out? I do too. Does this sound like you? You eat out at least three times a week and enjoy every minute of it. You love appetizers, large entrees and rich desserts. When you leave the table you are always stuffed. How do you prevent over eating at your favorite restaurant? Here are some ideas. Ask your waiter to remove the bread basket from the table. Before you eat, ask your waiter to box half of your entrée to take home. Decide to either share an appetizer or a dessert, and never have both. Skip the appetizer menu and instead start your meal with a side salad. Try some of these ideas, they may help. I bet that you work hard each day, and have become used to doing whatever is required to get the job done. You like to multi-task by eating at your desk or on the go, in your car for example. Your quick meals are grabbed on the run; and generally come from fast food restaurants, vending machines, and/or convenience stores. You don't plan your meals ahead of time and you end up eating whatever you can easily find. Sounds like millions of us, doesn't it. What can we do, here are a few ideas: pack a healthy lunch and bring it with you. Stock your work area with healthy protein-filled snacks. Drink plenty of water throughout the day, it's not only good for you it also helps fill you. Turn off the computer or pull your car over while you eat. Well there it is. A pretty interesting review of our eating habits. By making these healthy changes when it comes to your food decisions you will put yourself back on course toward healthy eating habits, fitness, and healthy weight loss. Remember, while nutrition is vitally important for weight loss, true results are achieved through a combination of both nutrition and exercise. You can make the change, if you need some help remember that's why I'm here. Simply call or contact me on our web site (www.sports-fitness-solutions.com). I'll be happy to help. Here is another simple habit change to help you eat less without feeling deprived. Instead of eating until you feel full, stop eating as soon as you are no longer hungry. Am I eating because it tastes good or am I eating because I'm hungry? I know it sounds simple, but over eating can be a problem for everyone. Fortunately it's a problem that can be controlled and overcome. If you're having trouble reaching your food and fitness goals feel free to contact and I'll be happy to help. Here's a recipe that is not only healthy but also spice up your breakfast. 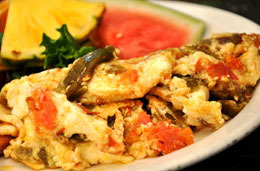 Egg whites, fire-roasted green Chile and diced tomatoes create a tasty omelet that is bursting with flavor and packed with protein. Serve with a side of salsa and sliced avocado. Nutritional: One serving equals: 163 calories, 5g fat, 6g carbohydrate, 2g fiber, and 26g protein.